Dylan O’Keeffe is just 13 points away from the Porsche Wilson Security Carrera Cup Australia lead after winning two races at Sydney Motorsport Park’s Red Rooster SuperNight 300. 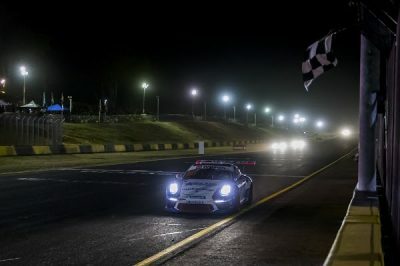 O’Keeffe qualified his APB Group Porsche second by a scant 0.05s margin, but took the lead at the start of the opening race and resisted pressure from former Supercars racer James Moffat to claim a lights-to-flag victory – his first race win in the category. “In qualifying, I made the tiniest mistake on my best lap – it cost me about a tenth of a second, which would have been enough for pole. “I was determined to make a good start in the race and I launched off the line to take the lead by the first corner. “It was an intense contest – Moffat was right behind me for the whole 16 laps, so I never had the chance to relax and I couldn’t afford a single concentration lapse. O’Keeffe fell back to third early in Race 2, but kept the pressure on his rivals and finished less than a second behind the winner. “My start wasn’t as good, and I made a couple of small mistakes in the early laps,” O’Keeffe said. The weekend finished with a special Carrera Cup Australia vs Asia Pro contest held on Saturday evening and while the race was not for championship points, O’Keeffe was still highly-motivated to bring home a result for the massive Aussie crowd that had flocked to the Western Sydney venue. “I made a beautiful start from fourth on the grid – my best start of the weekend – and I was up to second by the first corner,” O’Keeffe said. “I put the pressure on (Carrera Cup Asia driver) Martin Ragginger and he locked up at the second-last corner. O’Keeffe has now scored podium finishes in four of the five 2018 Carrera Cup rounds and will next be on track at Tailem Bend in three weeks.